I’ve been teasing my Instagram followers with pictures of these peanut, caramel, and chocolate slices over the past month. 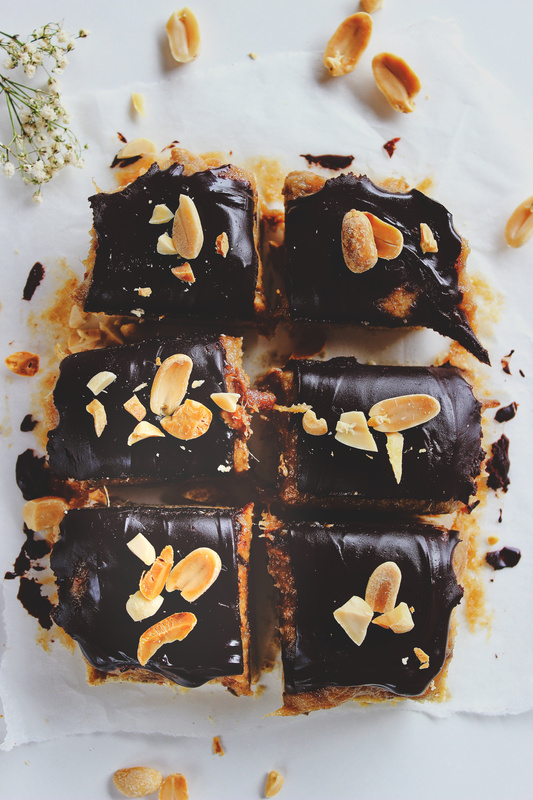 You only need seven ingredients to make these mouthwatering slices–with three of arguably the best flavours combined into one treat–and you won’t believe that they’re both gluten-free, refined sugar-free, and even grain-free! They might sound and look a little complicated, but these slices are actually really easy to make, and the layers are made with simple ingredients. The hardest part is having to wait before you can cut and bite into them! So these slices are made with three layers: the peanut, the caramel, and the chocolate. 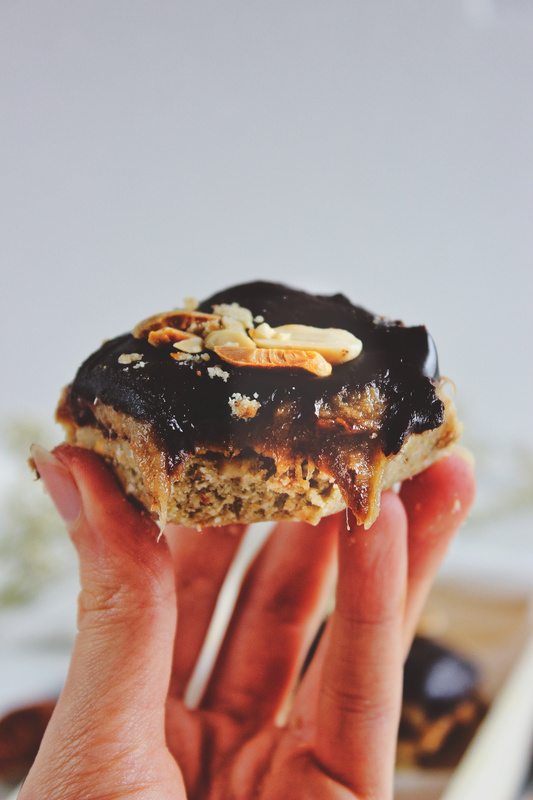 The peanut biscuit layer is made with buckwheat flour, peanut butter, maple syrup, and coconut oil. It’s simple and clean to contrast the richness of the caramel and chocolate. 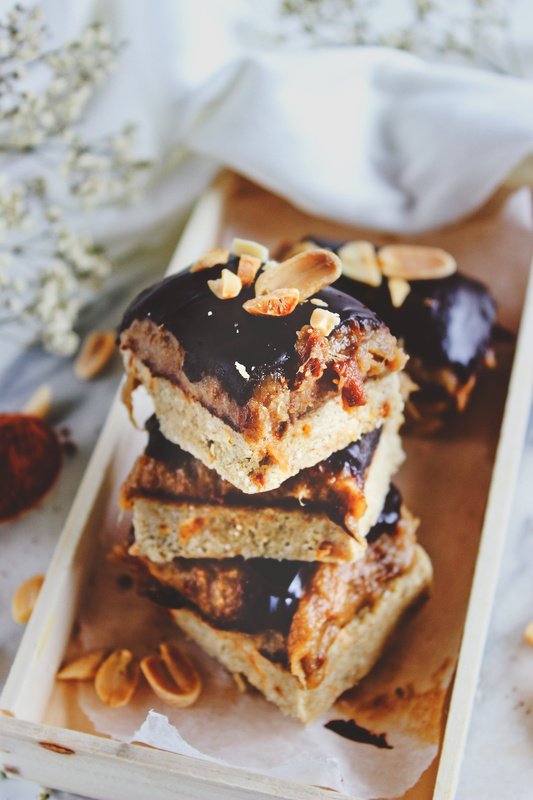 The date caramel layer is made with dates, cashew nut butter, and optional maca powder. It might actually be the best part about the whole recipe. It tastes so good, you can literally find me licking the bowl clean. The maca powder adds an extra touch of caramel, but you definitely don’t need it if you don’t have it. The chocolate layer is made with cocoa powder, maple syrup, and coconut oil. It’s simple, but really smooth and rich. 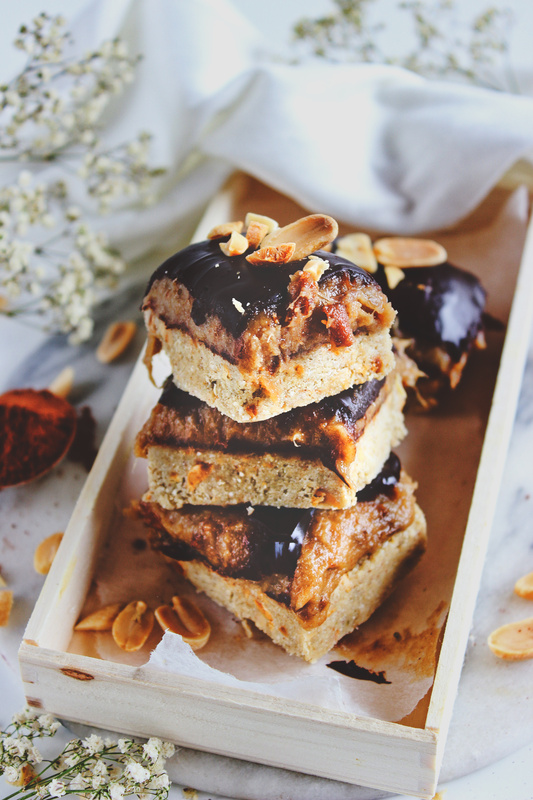 This means that you technically only need eight ingredients to make these peanut, caramel, and chocolate slices, or seven if you’re not using maca powder! 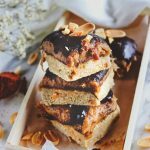 If you’re looking for more another vegan, but a little more indulgent, recipe, check out my Cinnamon Cake with Cocoa Icing–one of my favourites! 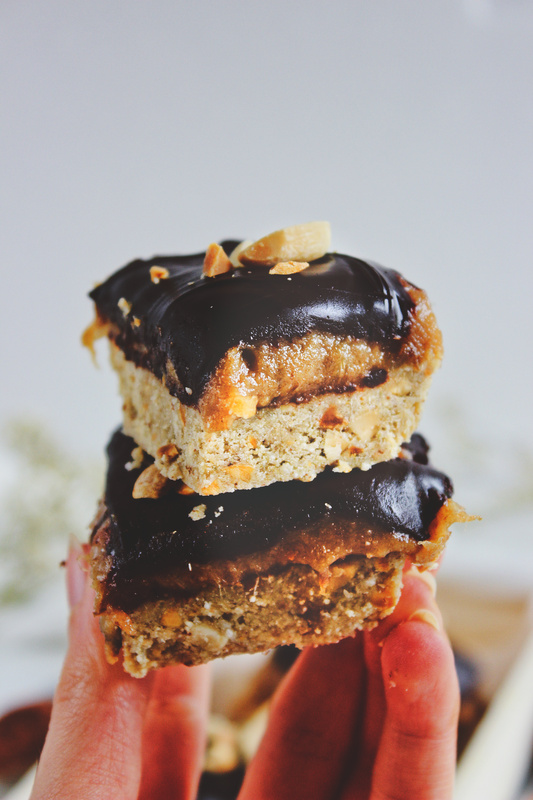 If you decide to give these peanut, caramel, and chocolate slices a try, let me know what you think about them. Rate them, leave a comments, and take a picture of your slices and tag me on Instagram. My profile name is @spirendeveganer. I’d love to hear your thoughts and see your recreation! Line a rectangular dish or freezer-safe container with parchment paper. In a bowl, mix together the buckwheat flour, peanuts, peanut butter, maple syrup, and coconut oil until you have a mixture that resembles sand. It should be crumbly, but stick when you press it together. Transfer the mixture to the prepared dish and press down evenly with a spoon. Place in the freezer while you prepare the caramel layer. Add the dates and water to a small pot and bring to a gentle simmer. Once simmering, reduce the heat to low and mash the dates with a fork until you have a thick paste. Transfer the paste to the bowl you made the peanut layer in, add the cashew nut butter and maca powder, and mix until combined. Spread the caramel evenly on the peanut layer and place in the freezer for another 15 minutes. In the meantime, make the chocolate layer: add the cocoa powder, maple syrup, and coconut oil to a small pot over high heat until the coconut oil has melted. Then turn the heat off and whisk until you have a smooth chocolate. If it's too thick to spread, add 1/2-1 tbsp water. Spread the chocolate evenly on the caramel and then place back in the freezer for 1-2 hours to set. Once set, remove the bar from the dish, cut into 6 slices, and enjoy! Store leftover slices in an airtight container in the fridge for up to 5 days. I make my own buckwheat flour by blending buckwheat in my blender. Can i swap buckwheat flour with other flour types? Hi, Ditte! I haven’t tried it with any other flour, but I think oat flour (and maybe rice flour) would work. Both oat and buckwheat flour are really easy to make in a blender! However, since there’s no baking involved in this recipe, I don’t see why all-purpose flour wouldn’t work, too. If you try it with another type of flour, let me know how it turned out!